On a cold, rainy day in May 1862, a young Union soldier, Henry Alexander Scandrett, would experience his first battle. Unfortunately it would be a losing battle. His regiment, the 70th New York, joined the attack on Confederate lines at Fort Magruder, an earthen redoubt two miles east of Williamsburg. The regiment saw heavy action; 350 men were killed or wounded. A small group of survivors, including Scandrett, were taken as prisoners of war and held at William & Mary. "Was in my first battle today. About 1 Oclock P.M. our regiment was marched into the field about. We were thrown in advance and through some blunder was not reinforced. We have lost all our company officers and our field officers are all wounded. With fifteen others I was taken prisoner and am now in William & Mary college." This is the first record of Union prisoners of war being kept at William & Mary during the battle in 1862, according to local historian, Wilford Kale ’66. While the information about William & Mary is really extraordinary, Jay Gaidmore, director of William & Mary Libraries’ Special Collections Research Center, adds that the diary provides a special insight into many facets of the Civil War. “It tells so much about the experiences of Union soldiers and the history of eastern Virginia during the war,” said Gaidmore. Now thanks to the generosity of Scandrett’s great-grandchildren, the diary is part of William & Mary Libraries’ Special Collections Research Center. Siblings Janet Hunt, Sharon Summers, Charles Scandrett, Barbara Kaufman and Sandra Ellender had been searching for a place to have it preserved. After a conversation with Kale and a visit to the Special Collections Research Center, they decided the diary should return to the place where it was written. 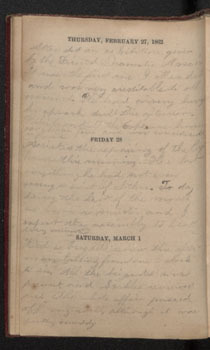 In his diary, Scandrett included significant amount of detail regarding his experience as a Union soldier fighting on the Virginia peninsula. Daily entries document camp life, weather, rations and events, including serving as a pallbearer for the funeral of one young soldier who died from typhoid fever. During the regiment’s trip down the Potomac River to Fortress Monroe to participate in the Peninsula Campaign, Scandrett saw both the Monitor and Merrimac but his transport had to leave before any battle took place. W&M Libraries’ digital services team has digitized the diary, making it freely available online via its Digital Archive. “The diary is a valuable resource that reveals fragments of William & Mary's past, as well as events from the nation’s history. It is a welcome addition to the library's special collections, and we expect it to be regularly used by faculty, students and researchers globally to piece together important historical narratives,” said Gaidmore.